In fact, evidence would suggest that many physicians, as well as key segments of the entire physician community, are undereducated in genomics as a whole. 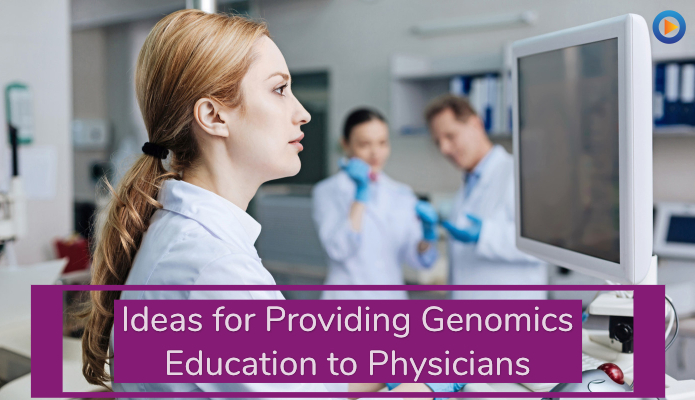 Being able to explain the benefits and drawbacks of genomics at crucial times during a patient’s treatment is vital for doctors, but, unfortunately, this education gap persists despite the best efforts of many players in the genomics industry. It’s not just the doctors that know that they’re undereducated; a poll of 1,000 U.S. patients found that over 90% of them don’t trust that their doctor is sufficiently educated in genomics and personalized medicine. For genomics companies, this education barrier presents a serious risk to the ultimate benefits of genomic medicine. To combat this, the genomics industry needs to find a way to layer content so that it is easily digestible while still imparting critical knowledge to healthcare providers. In essence, the genomics industry needs to key in on critical marketing strategies that will help them leverage education without falling back on overly dense medical journals — marketing strategies like using video for provider education. Marketing genomics is tough. You have to use your marketer’s toolbox in a very creative way to inject yourself into the healthcare industry. Finding a way to penetrate what little free time doctors have is compounded in difficulty by competing companies across the healthcare industry. Everyone wants a piece of their time, and they don’t have very much of it. Inbound marketing strategies can help you stand out from your competitors, which, if you’re vying for a doctor’s attention, happen to be every other healthcare company on the planet. This is where videos come in. Unlike dense academic papers or white paper copy, videos can get to the core of an issue fast and in a way that’s visually pleasing. We — as a video marketing company — are deeply embedded in the inbound marketing industry, and we have used video creatives for several healthcare products, providers, and systems; they work. Video reaches doctors in the document-saturated healthcare field that copy simply doesn’t. There’s a reason that 85% of the U.S. audience watches videos online and that half a billion (500 million) people watch Facebook videos every single day. Video has a way of capturing our attention. Not only does video capture our attention, but it also holds it. The average user spends 88% more time on a website if it has video content. It’s not just the sampled population that’s watching so much video either, in a study with over 300 executives at top-level companies, 80% of them said that they watch more video content than they did the year before. This is continuing to grow. The end result here is that people are heavily engaged by video content. It’s visually appealing, gives you dense information without requiring significant time, and video is excellent at showing critical concepts. Not only is video great at capturing attention, but it’s also great at helping us retain information. Information retention is hyper-important for those working in the genomics space. Genomics is on the rise, and to be systematically introduced clinically, doctors are going to have to learn and retain information on best-practices and clinical use. We’ve seen this in the nursing industry. Nursing, as a whole, has some systematic placement for genomics in education. Certifications and tests relying on recall and retention have been major drivers in increasing genomics awareness in the nursing profession. A video is the king of creatives when it comes to attention. Did you know that people will retain 95% of video content compared to only 10% of text-driven content? That’s a huge difference. Video as a Converter Whether your goal is simply education or it’s converting doctors, conversion statistics matter. If you can convert a customer, you can certainly educate them. We know that lots of you out there are looking to boost your bottom line, and getting directly in front of doctors seems like a perfect way to do that. Well, you would be right. Physicians are already searching for your video content. In fact, 61% of professional content viewed by physicians on mobile devices is directly clinical related. Genomics companies are in the driver’s seat, but most of them don’t know which direction to go. The landscape of healthcare is continually shifting, but you have to remember that doctors are people too. They consumer content just like the rest of us, and video is great at grabbing us and converting us into customers. Did you know that 64% of people will make a purchase after watching branded social media content? Or that over 50% of marketers around the world consider video the content with the best ROI? Video is the best conversion tool in a marketer’s arsenal. You can embed in-depth educational content without risking losing HCP’s attention. We know from experience that video is an excellent converter, attention grabber, and retention tool, and statistics back that up. For many of you, depending on your position in the genomics field, conversions or education may not be your primary objective. Maybe you’re focused on delivering critical content updates while you leave your marketers to conversion and education — that’s fine. Video can still play a crucial role in any level of communication between your company and HCPs. If you would like to know more about how video can help you close that education gap between genomics and health care providers, or you would like to know more about how you can use video as a conversion tool in the healthcare industry, contact us. We would be happy to help any of you or answer any questions.